Join us on a journey of discovery: we're going to learn all about articles! In Session 1, Emma and her travelling friends introduce us to those three little words that can mean so much. Read Sophie's travel blog. She's having a great time sightseeing in Switzerland - the land of snow-capped mountains, beautiful wooden houses and delicious chocolate! Word challenge: While you read, try to find words with these meanings. The answers are underneath the blog. 1. An informal word that means 'expensive'. 2. The style and design of buildings. 3. Visiting interesting places, as a tourist. 4. Lying in the sun, to make your skin darker. 5. Connected to art, music, literature, etc. 6. The feeling you get from being in a particular place. "Welcome to Switzerland. I love it here. I often come here for a break and to get away from the crowds and pollution of my home city. It's quite cheap to get here on a low-cost airline and it's quick too: just a two-hour flight and I'm here, enjoying the fresh air, the picture-postcard views and the friendly people. There are lots of reasons to visit Switzerland. In cities like Zurich and Geneva, you can find amazing architecture from old cathedrals to modern museums and converted factories, exciting cultural life including museums and art galleries, and lots of opportunities for sightseeing and photography - as well as great shopping. But be careful: Switzerland can be very pricey - so if you like to shop, you’ll need to take plenty of money with you. But it really is the mountains and lakes that I love most, and the best way to get to see them is on a train. No mountain is too high for a Swiss train. 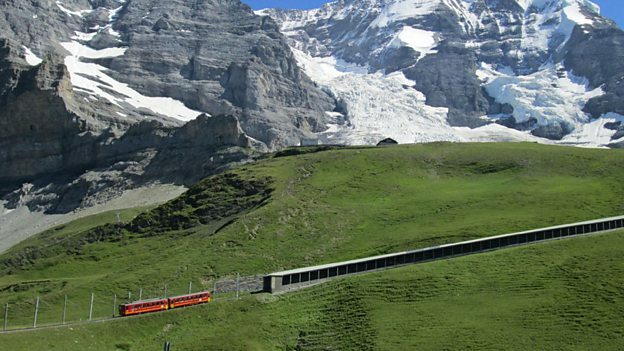 I took a train on The Jungfrau Railway, which leads from Kleine Scheidegg through the Eiger and Mönch to the Jungfraujoch. I love walking in the mountains. The view across the Alps is spectacular as you can see! The air feels so fresh up here and the colours seem so bright, especially the green grass. It's no surprise the cows up here look so happy - but they still need to wear a huge bell around their neck so they don't get lost! When you're out walking, don't be surprised if you meet some of the local men wearing leather shorts, called lederhosen, and sturdy leather boots. This is traditional clothing in the Alps: it’s not worn to impress tourists but as a reminder of their heritage - and apparently they're quite comfortable too! It can be quite cold in the mountains - so if your ideal holiday involves sunbathing by the pool, the Alps might not be the right place for you. But if you like wonderful views, a peaceful atmosphere, and long walks in a beautiful natural environment, this is a great destination." Here is the key to the vocabulary challenge. Have a look and check your answers. Let's practise using some of the vocabulary from Sophie's blog. Try this activity. The place you go to when you travel. It’s a long flight – it’s another 4 hours until we reach our ______. The style and design of buildings. He knows a lot about buildings. He’s very interested in ______ . Based on past customs and beliefs by a certain group of people. I like modern music, but I also like the old, ______ music of my country. An informal word meaning ‘expensive’. That restaurant is very ______. Let’s find a cheaper place to eat. Lying in the sun, to make your skin darker. You shouldn’t spend so much time ______! It’s bad for your skin! How did you do? We'll be using some of this vocabulary later in the unit. On the next page Finn and Catherine will tell you all about the compound adjectives in phrases like 'low-cost airline' and 'two-hour flight' in 6 Minute Vocabulary. By the way, the answer to the question in Activity 1 is: Emma said a 3 times, an once and the 4 times. These little words are called 'articles', and English speakers use them all the time - as we're going to find out. the situation around us - particularly the land, air, water, etc.